Titatnium Multitool Carabiner. Best Unique Tool Gift for DIY Handyman, Father/Dad, Husband, Boyfriend, Men and Women. 100% TITANIUM - The Ti-6AL-4V Titanium Alloy is an alpha-beta titanium alloy featuring high strength, low weight ratio and excellent corrosion resistance. EXTREMELY FUNCTIONAL - This multitool packs 12 tools into a credit card-sized carabiner multi-tool including a flat head and phillips style screwdriver, 7 wrenches, a bottle opener, a can opener, a hex bit driver and keyloop. PERFECT GIFT - This cool titanium tool makes a great birthday gift for men, birthday gift for women, Father's Day gift, Christmas gift, graduation gift, wedding gift, business gifts and corporate gifts. 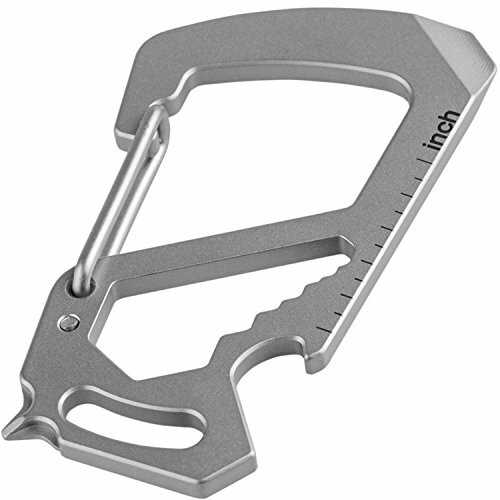 TSA CHECKPOINT FRIENDLY - This ThorKey carabiner multitool gadget is compliant with current TSA regulations for allowable carry-on items and will fit easily on your keychain or in your pocket, purse and bag. 100% RISK FREE PURCHASE: We offer a 30 day 100% money back guarantee in case this titanium pocket multi tool key chain does not live up to your expectations. If you have any questions about this product by ThorKey, contact us by completing and submitting the form below. If you are looking for a specif part number, please include it with your message.